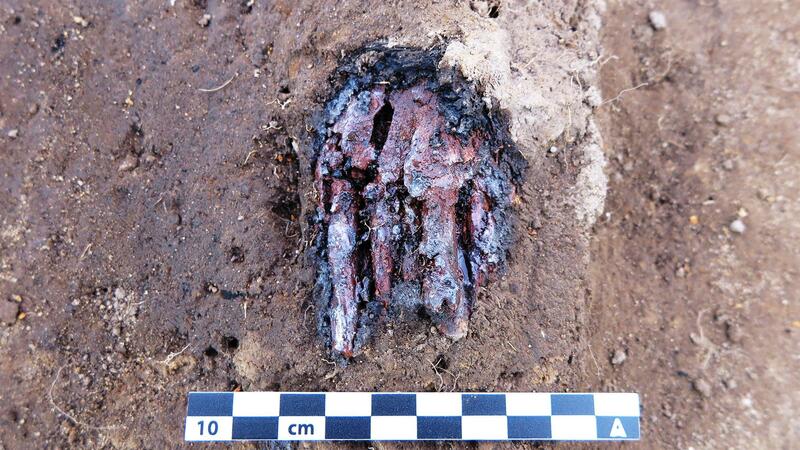 Archaeologists have found evidence of homegrown grapes in late Iron Age and Viking Denmark: two charred grape seeds unearthed from a site on the west shore of Lake Tissø, Western Zealand. This is one of the richest sites from the late Germanic Iron Age and Viking Age ever discovered in Denmark. Since the 1990s, excavations have unearthed two aristocratic residences (one dating to 550–700 A.D., the second to 700–1050 A.D.), pit houses, assembly places, a market and artisan workshop area and ritual sites. In the 2012-2013 dig season, the team collected soil samples for macrofossil analysis from both the aristocratic residences. 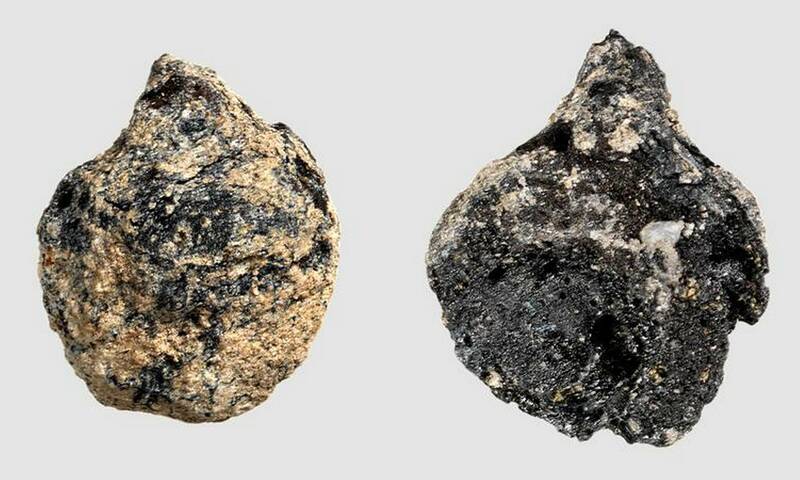 In 2015, archaeobotanist and curator at the National Museum Peter Steen Henriksen recovered one charred seed while sifting through a five liter soil sample from Bulbrogård, the oldest of the royal complexes. Examining it under the microscope, Henriksen could see that it looked like a grape seed; the charring had not altered its shape. A colleague confirmed the identification. It was indeed a seed from the common grapevine (Vitis vinifera). He found a second grape seed in a soil sample taken from the later royal complex, Fugledegård. Before this find, the earliest grape seeds found in Denmark date to the late Middle Ages, and historical records from the 13th century support that grapes were grown in Denmark during the medieval warm period. Because this was such an exceptional discovery, the grape seeds were studied in further detail. Each seed was subjected to archaeobotanical analysis. One of them, the one from Fugledegård was radiocarbon tested. The C14 result dated it to between 780 and 980 A.D., the Viking Age. The Bulbrogård was not dated because researchers wanted to preserve it for strontium isotope analysis. (The testable cores of the seeds are so small it wasn’t possible to run both tests on each.) The strontium isotope results placed the grape seed squarely in the range characteristic for Denmark, specifically Zealand. 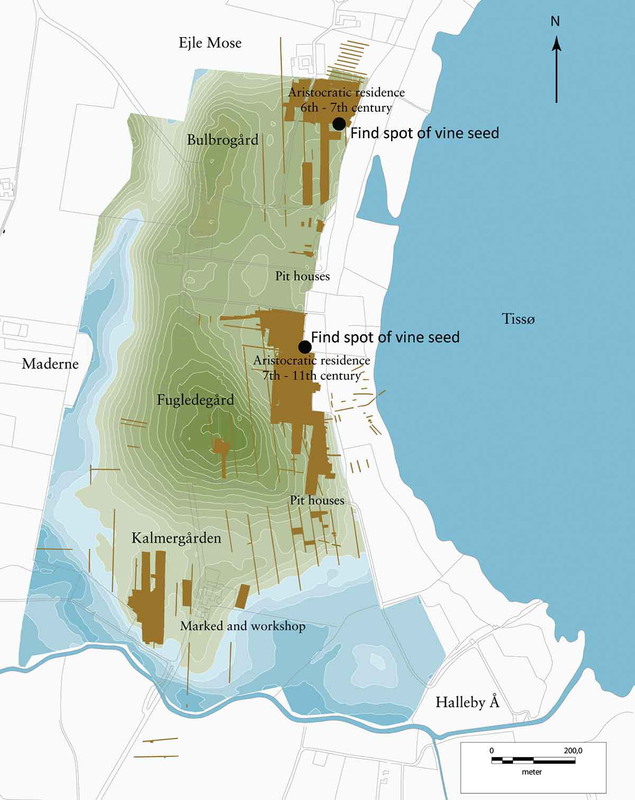 They are by far the oldest grape seeds discovered in Denmark, and the first potential evidence of local viticulture in late Iron Age/Viking Age Denmark. There’s no way to confirm the seeds were used to grow grapes at Lake Tissø. They could have been in the lees of a wine barrel, although that would not explain how the seeds were found in two complexes that were 600 meters and at least a hundred years apart. Besides, it’s hardly an import if the raw material was grown on the island. The results of the study have been published in the Danish Journal of Archaeology and can be read here. Guennol Stargazer sells for $14,471,500, or does it? 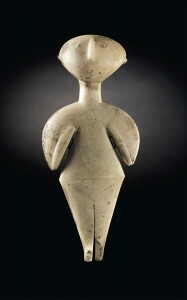 The Guennol Stargazer, an Anatolian marble idol carved in the Chalcolithic period, around 3000-2200 B.C., sold at Christie’s Exceptional Sale in New York on Friday for $14,471,500. 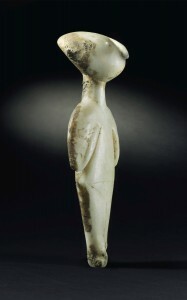 The idol is of the Kiliya type, a stylized, geometric female figure known as “Stargazers” because their flat, wedge-shaped heads perched on slender necks give the appearance that they are looking up at the skies. 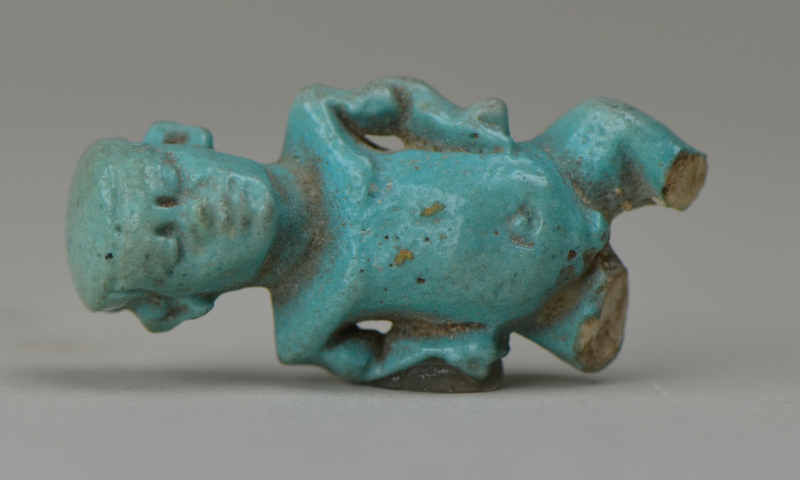 They’re usually found in fragments — breaking them at the necks may have been part of a ritual burial of the figurines — and broken heads and bodies are fairly common. This example, however, is one of only about 15 complete Stargazers (it has been repaired to reattach the head to the neck), and it is widely acknowledged as the greatest of them all. She is the tallest at nine inches and is more long-limbed than her sisters, who tend towards a squatter proportion. The Schuster Stargazer, the last marble Kiliya-type idol to sell at auction, went for a bargain $1,808,000 in 2005. It’s not surprising that the Guennol Stargazer as the preeminent example of the type smashed through that ceiling. While some press outlets reported an estimated sale price of $3 million, Christie’s did not have a pre-sale estimate posted on its website like it usually does. They made one available by request only, which may be an indication that they knew the sky was the limit. Also, estimates usually rely on comparables as well as market determinations, and in terms of quality, design and provenance, the Guennol is in a category of her own. There is something of a cliffhanger ending to this episode. The person who made the winning bid may or may not get his or her hands on the Stargazer after all. Culture Minister Nabi Avcı announced to the press on Friday that Turkey has opened proceedings in US court to stop the sale. The Turkish government believes the idol was unearthed in Gallipoli (Kilia, the town where the first figure of the type was found, is on the Gallipoli peninsula) and that it is therefore the legitimate owner. In order to successfully pursue its case in a US court, Turkey needs to have relevant law establishing state ownership of antiquities, which it clearly has, and, the big challenge in this instance, it has to prove that the disputed artifact was unearthed within its national boundaries. The court has given Turkey 60 days to provide said proof. Minister Avcı says they have the “necessary scientific reports showing the statue belongs to Turkey” and will submit them within the two month deadline. Meanwhile, Christie’s is enjoined from transferring the Guennol Stargazer to the buyer until the case has been decided. Archaeologists excavating the Fregerslev Viking grave south of Hørning near Skanderborg in Jutland, Denmark, have discovered a bundle of arrowheads at the bottom of the grave. The bundle appears to contain six heart-shaped iron arrowheads. There’s a layer of black organic material at the pointed end of the arrowheads that archaeologists believe to be the remnants of the quiver, long-since decayed. These were probably not weapons of war. They were likely used for hunting deer and wild boar. It’s even more evidence of what an elevated position the Fregerslev Viking held in society. Only the elite would have had the opportunity and means to go hunting, so the bundle of arrows buried with him are symbols of high status. Arrowheads are very rare discoveries in Viking rider graves. A whole quiver of them is practically unheard of, and the Skanderborg Museum archaeologists are justifiably elated by the find. As with the other rich discoveries in the grave, the arrowheads were not fully excavated in situ. They were removed in a soil block earlier this week and taken to the museum laboratory to be X-rayed. 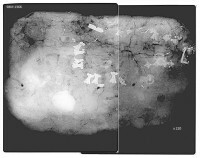 The X-ray should show archaeologists how many arrows are in the bundle and give them a roadmap for excavation of the block in the lab. Reaching the bottom of the rider’s grave is an important milestone. It’s only 28 centimeters (11 inches) deep at the deepest point — it’s a miracle that it wasn’t destroyed by agricultural activity — but the sheer amount of corrosion from metals including gold, bronze and silver visible on the surface of the trench indicates there are still an extraordinary number of expensive grave goods under there. 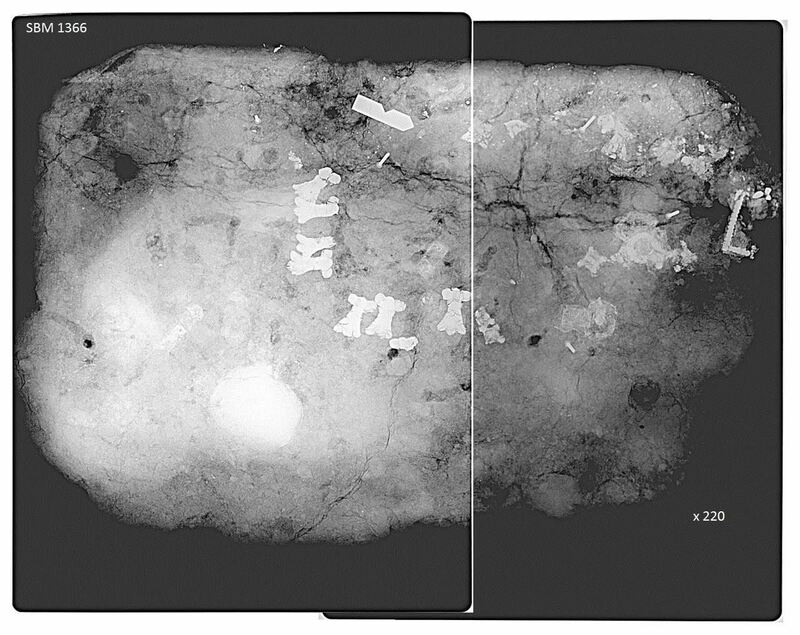 Experts are still in the process of X-raying the soil blocks that have already been removed. 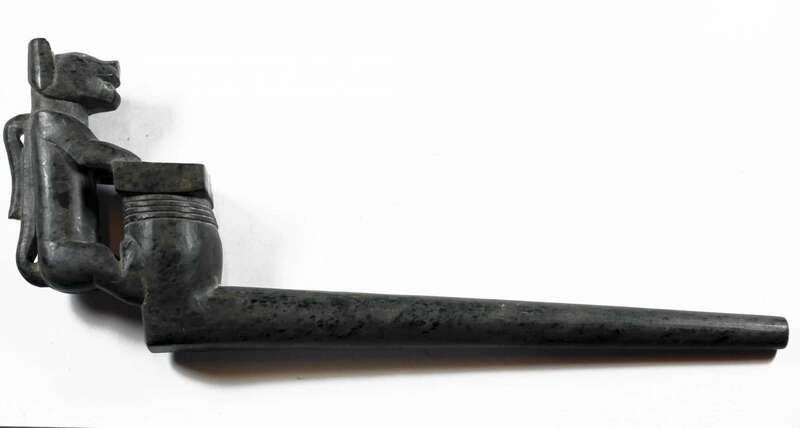 One lifted from the foot of the grave near the block that was already found to contain star-shaped bridle fittings contains even more fittings. 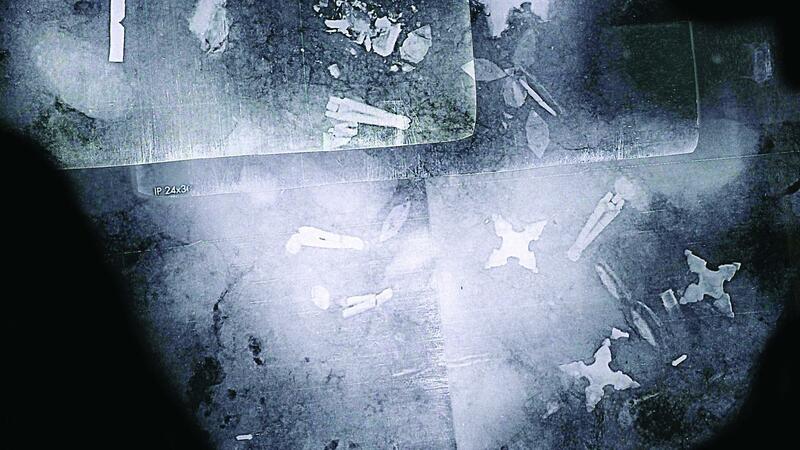 The ones showing as bright white in the X-ray are silver or silver-plated. There are new types of hardware in the block that archaeologists believe to be decorative elements from a harness and/or stirrups. There is no sign of the stirrups themselves, however, which the team are keen to find. They hope excavation and X-rays of other soil blocks will find evidence of the stirrups. The shiny things aren’t the only archaeological treasures in the grave. Archaeologists will be using the latest and greatest technology to analyze the soil for microscopic remains that will allow them to identify species of plants that were once inside the grave but have decayed along with the human and horse remains. They’re also going to look for DNA in the soil. German archaeologists have recently had a breakthrough in this cutting-edge technology, successfully isolating prehistoric DNA from the soil and clay of caves with nary a bone or tooth in sight. Ireland’s Heritage Council and Heritage Maps have launched a new dataset mapping all the Sheela-na-Gigs in situ and in collections around Ireland. 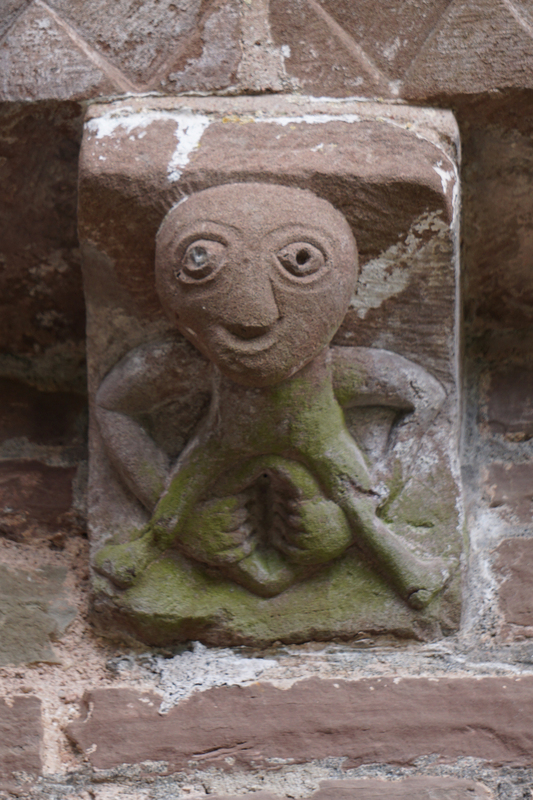 Sheela-na-Gigs are female figures often characterized by bands across the forehead, visible ribs, and most notably, their hands spreading their vulvas wide open. They are found in the UK and to a lesser degree on the continent (mainly France and Spain), but Ireland has the greatest number of Sheela-na-Gigs. They are most commonly seen in churches and monasteries, usually ones of medieval Romanesque design or in newer ones that incorporate salvaged elements of earlier religious structures on the site. They are also found in lay buildings like castles. 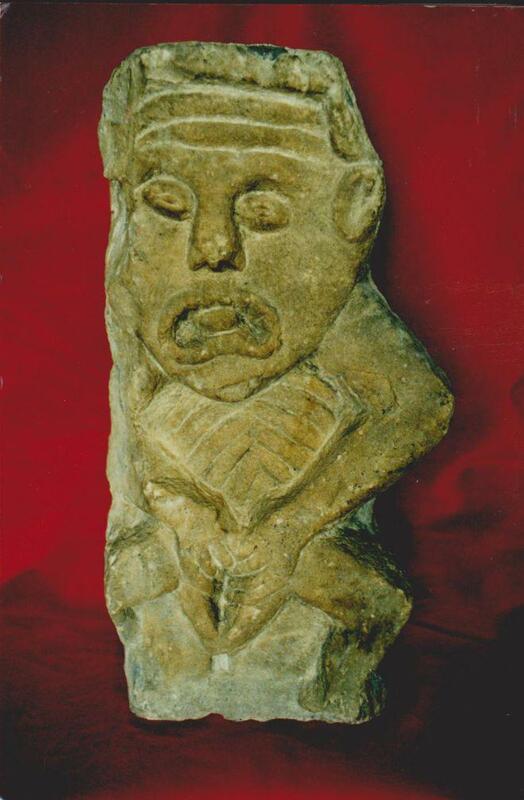 Discussing the launch of this new cultural resource and the St. Patrick connection, renowned UCC folklorist Shane Lehane suggests “that perhaps the key to understanding the inherited notion that St Patrick had a wife, Sheela, is to explore the hugely interesting archaeological manifestation that also bears her name: the Sheela-na-Gig”. “In Ireland, there are over 110 examples of these, oft misunderstood, medieval stone carvings of naked, old women exposing their genitalia. They are often positioned in medieval tower-houses, medieval church sites and holy wells. Up to recently these were seen as figures representing the evils of lust or as ways of averting the ‘evil eye’. More convincing reassessments have reinterpreted the Sheela-na-gig, in line with the Cailleach, as belonging to the realm of vernacular folk deities associated with the life-giving powers of birth and death. Placed with the cycles of both the natural and agricultural year and the human life cycle, she can be regarded as the embodiment of the cycle of fertility that overarches natural, agricultural and human procreation and death”. There are probably more Sheelas that haven’t been officially documented yet. The Heritage Council is hoping to add to the layer with new information and asks that members of the public contact them if they know of any Sheela-na-Gigs that are not yet marked on the map. As the name suggests, Heritage Maps is a collection of culture-related data sets marked on a map of Ireland. You can select different layers to view on the map — shipwrecks, UNESCO World Heritage sites, burial grounds, walled towns, museums, protected architectural sites, and hundreds more — and create the mother of all heritage tours customized to your interests. There are more than 150,000 sites pinpointed in all of the layers, and the number increases all the time. To view the new Sheela-na-Gig dataset, click on the Archaeology category in the Layer List and check the Sheela-na-Gig box. You’ll see the map populate with data points. Click on one of the points and then on the right arrow after the name for the full information to drop down, including a photo (just thumbnails, alas). Artifacts and remains of the Wampanoag leader who forged the first alliance with the Pilgrims are being reburied in his original grave after a two-decade search for the scattered relics. 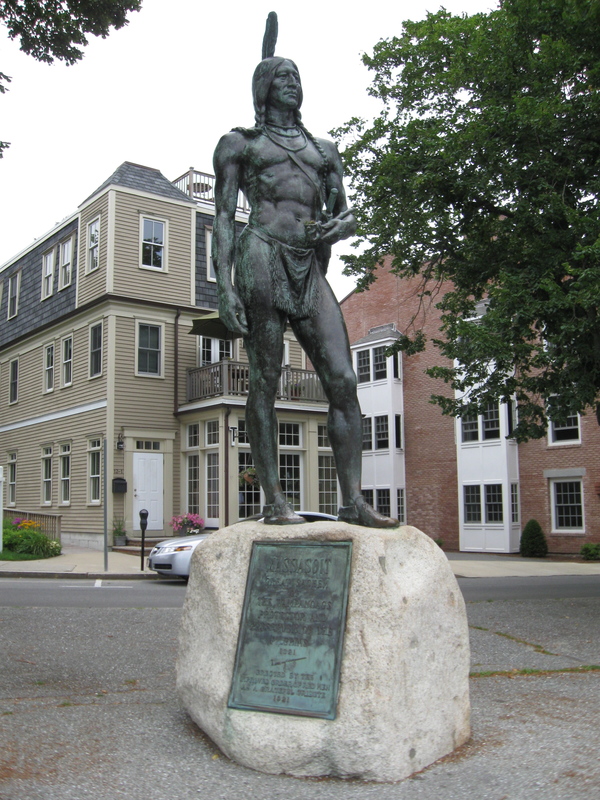 The Pilgrims called him Massasoit as if it were his first name and it has stuck, but in fact it’s a hereditary title meaning “Great Leader.” His name was Ousamequin. As Great Leader of the Pokanoket Wampanoags, he held the allegiance of numerous chieftains and villages in the Wampanoag Confederation stretching from Narragansett Bay east to Cape Cod, most of modern-day southeastern Massachusetts. In the six years before the Mayflower landed at Plymouth, two smallpox outbreaks had decimated the Pokanoket, reducing their warrior ranks from a formidable 3,000 to a mere 300. With their enemies the Narragansetts at their doorstep (they controlled the territory west of Narragansett Bay), ready to take advantage of the Pokanoket’s military weakness, in March of 1621 Ousamequin entered into a treaty of nonaggression and mutual defense with the newly arrived English colonists. They agreed not to attack each other and to come to each other’s aid if either one were attacked by third parties. The English had weapons and the ability to use them; the Pokanoket knew how to grow, make and find food. The military alliance was advantageous to both, since the Narragansetts were as ill-disposed towards the English as they were toward the Pokanoket, and good relations with their indigenous neighbors were essential to the survival of the colony. Without them, the Plymouth colony would quickly go the way of their countrymen at Jamestown and starve to death. As it was, they only had a place to live because they had moved into a Pokanoket village (Patuxet) left abandoned after a smallpox epidemic, and although Ousamequin didn’t know this, at the time of the alliance barely three months after their arrival, almost half of the colonists and Mayflower crew had already died from diseases contracted during the Atlantic crossing. The alliance lasted 40 years, ending only with Massasoit Ousamequin’s death in 1661. English sources acknowledge that the colony would almost certainly have died on the vine in those difficult first few years without his invaluable aid and recognized him as a man of unimpeachable integrity, loyalty and generosity. That didn’t stop the growing colony from encroaching ever more on Pokanoket lands, of course, and as the decades passed, the alliance became increasingly strained. 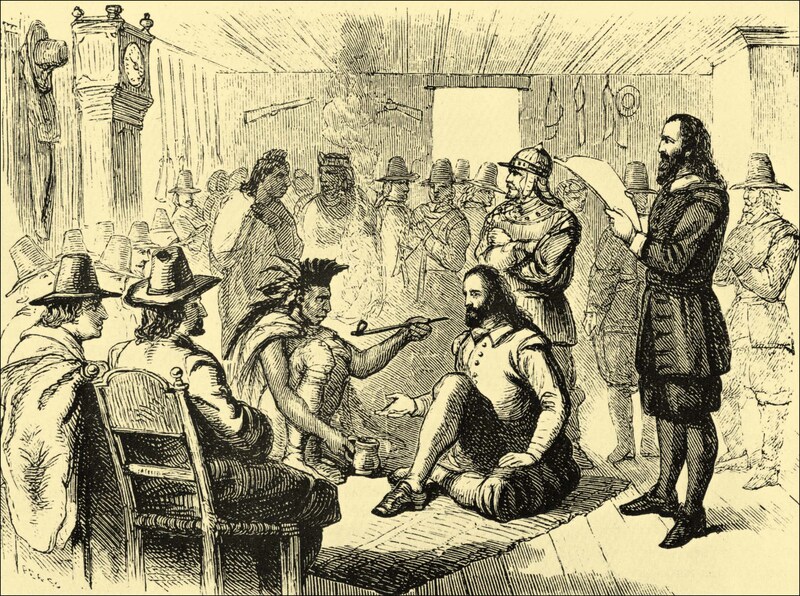 Under pressure from all sides, Ousamequin chose to keep the alliance together and repeatedly sold the colonists ever-larger sections of Pokanoket territory. In 1653, he and his eldest son Wamsutta sold land known as Sowams which included most of the present-day towns of Warren and Barrington, Rhode Island, and Somerset, Massachusetts, for 35 pounds sterling. The buyers were a who’s who of early New England history: Miles Standish, Josiah Winslow, William Bradford, John Winslow, et al. One small piece of Sowams was not part of the sale: the “neck,” meaning the uplands overlooking the bay. Called Montaup, anglicized as Mount Hope, this was Ousamequin’s hometown and was to be reserved for the Pokanoket until such time as they chose to leave. After his death, he was buried there. 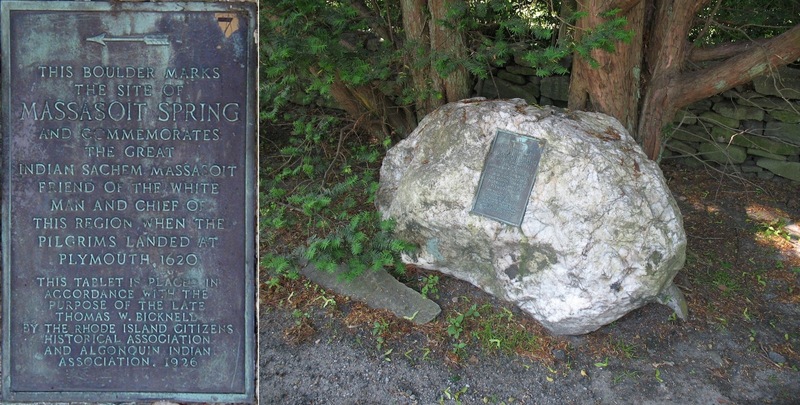 By the end of King Philip’s War (King Philip was the English name of Massasoit Metacom, Ousamequin’s second son, who took up arms against the Plymouth Colony in 1675 to stop their untrammeled expansionism) in 1678, the surviving Pokanoket fled to Maine and Mount Hope Neck was absorbed into Warren, Rhode Island. Neglected and unprotected, Massasoit Ousamequin’s grave was destroyed during construction of the Providence, Warren and Bristol Railroad, which opened in Warren on July 4th, 1851, 190 years after Massasoit’s death. His wasn’t the only grave on the hilltop, and souvenir hunters and archaeologists (who at this time were also largely souvenir hunters) dug up the site, collecting artifacts and human remains which wound up dispersed throughout personal collections and museums. In 1990, the Native American Graves Protection and Repatriation Act made it federal law that grave goods and human remains held in collections, institutions of learning and museums be returned to related tribes for reburial according to their religious traditions. 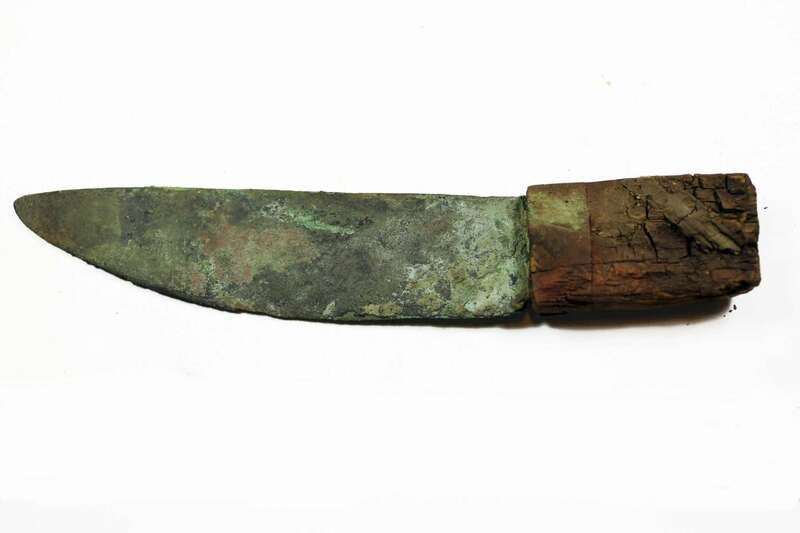 Ousamequin’s artifacts include a pipe, knife, beads and arrowheads. The Rhode Island Historical Society has repatriated about 75 items to the appropriate tribes since the law’s passage, including artifacts belong [sic] to Ousamequin. They were donated as relics in the 1800s, but collections aren’t assembled in that way today, said Kirsten Hammerstrom, director of collections. 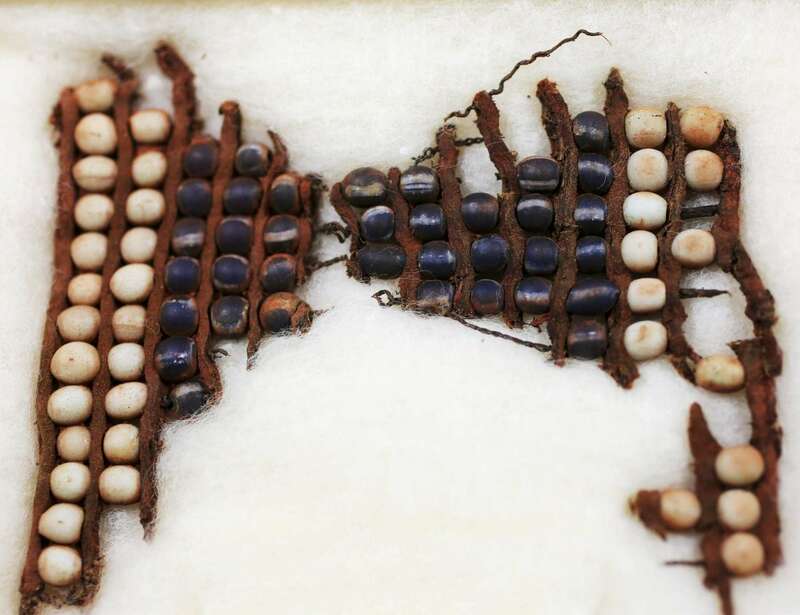 The Wampanoags have collected hundreds of funerary objects that were removed from the burial ground on the hill and held dozens of burials for their ancestors whose graves were disturbed, Peters said. “It is an honor and a privilege to be able to do this for our ancestors,” she said. Now it’s Massasoit Ousamequin’s turn. 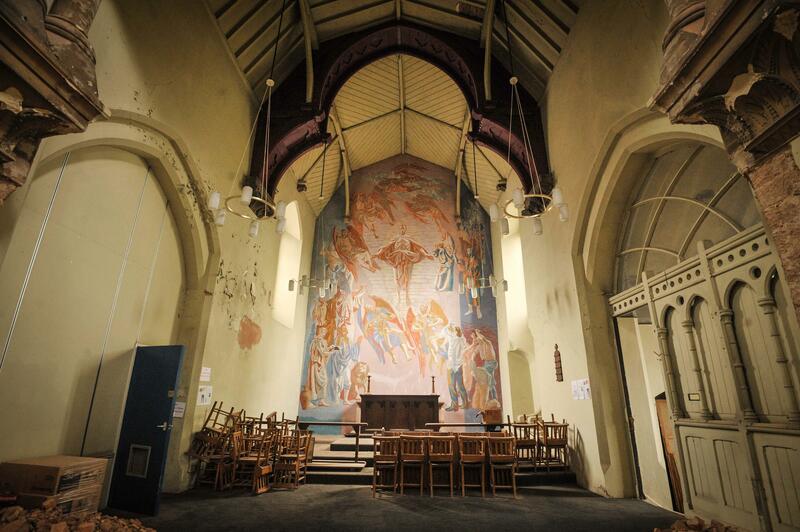 A monumental mural painted by Jewish artist Hans Feibusch in St Mark’s Church in Coventry has been revealed after spending 44 years hidden behind a brick wall. It’s been hidden more than four times longer than it was in view, but now it’s out in the open for good. A Victorian Gothic Revival church built in 1868, St Mark’s managed to survive the levelling of the Medieval city of Coventry by German bombing raids in World War II. The great stained glass window in the west wall was the only casualty. The church couldn’t afford to replace the window in the lean war and post-war years, so they bricked up the hole and the church was left with a very large, very plain wall where the window had once been. 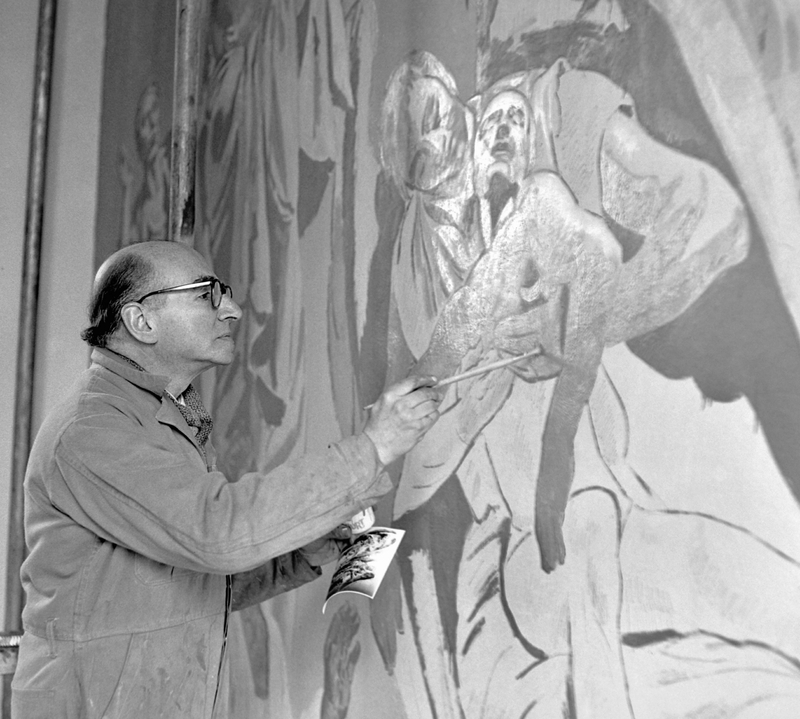 In 1963, Hans Feibusch was commissioned to paint a mural depicting the Ascension of Christ on that plain wall. Born in Frankfurt in 1898, Feibusch served two years on the Eastern Front during World War I. After the war, he studied art and began working as a professional artist in 1925. He was quickly successful, winning an award from the Prussian Academy of Arts in 1931. When the Nazis came to power in 1933, Feibusch saw the writing on the wall and hightailed it out of Germany to England. While he built a new life for himself in England, back in Germany Hitler’s personal taste in art was being enshrined as the ideal while the avant-garde that had thrived under the Weimar Republic was reviled as “degenerate,” the nobility of classical forms distorted and deformed by Jewish contamination of the culture. 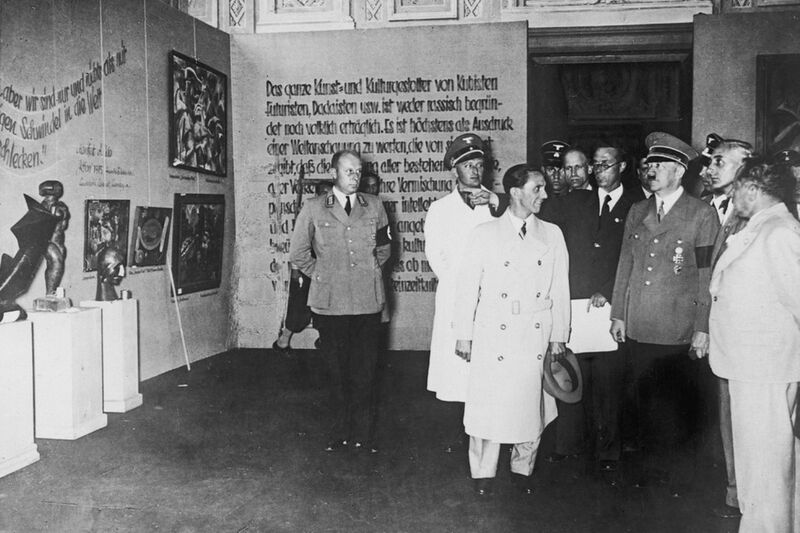 In 1937, Propaganda Minister Joseph Goebbels put together a Degenerate Art (Entartete Kunst) exhibition in Munich that collected the modern art his ministry had pulled from the walls of galleries, museums and private collections. Feibusch’s work was displayed alongside Jankel Adler’s and Marc Chagall’s next to the slogan “Revelation of the Jewish racial soul” written on the wall. Feibusch’s career really took off in England after the end of World War II, thanks largely to the destruction wrought by German bombs. He became known as a muralist, especially as a church muralist. His main patron was the Bishop of Chichester Dr. G.K.A. Bell, who commissioned murals in Chichester Cathedral and in the bishop’s palace. 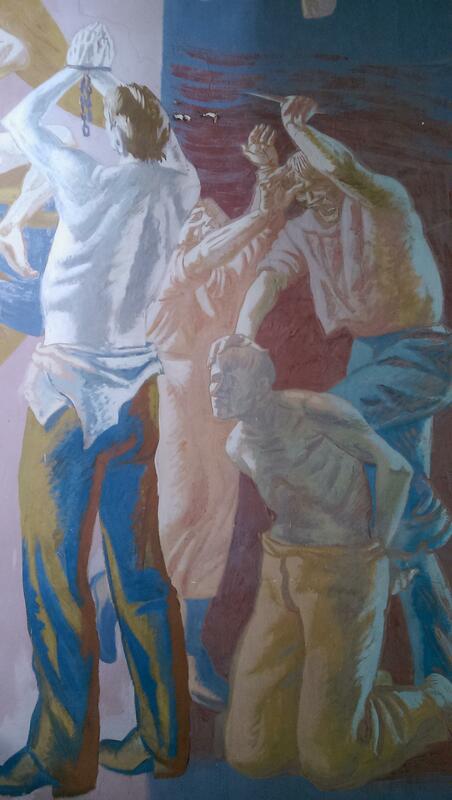 Churches in Brighton, Portsmouth, Eastbourne and other cities small and large also commissioned murals from Feibusch. He ultimately painted murals for 30 churches, including St Mark’s, and major civic buildings like Dudley Town Hall in Worcestershire. St Mark’s Church was deconsecrated in 1973 and converted into the outpatients department of the Coventry and Warwickshire Hospital. 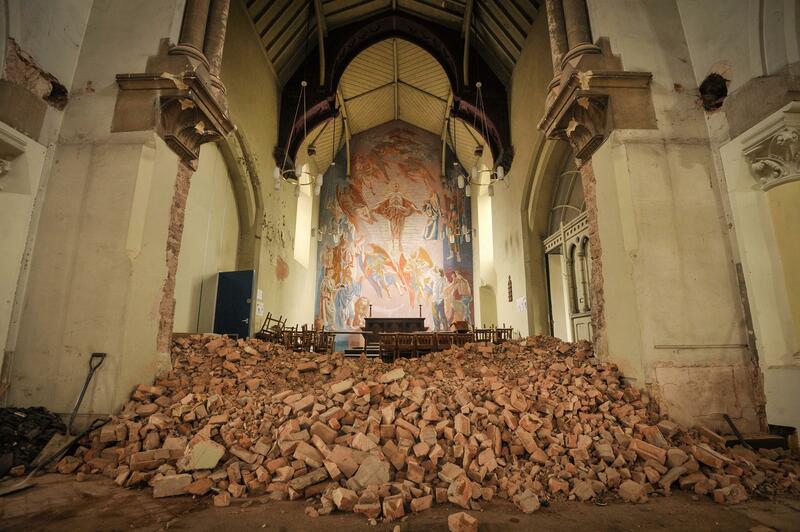 For the mural’s own protection (and maybe to make the space a little less obviously a church), the Ascension was bricked over. Even though out of view, it wasn’t forgotten. Hans Feibusch lived a very long life, dying four weeks shy of his 100th birthday in 1998. He not only outlived all of the Nazis who labelled his art degenerate, but also all of his fellow so-called “degenerate artists.” He is buried in Golders Green Jewish Cemetery. What form this service would take she wouldn’t know for some years, but at least by 1844, nursing was on her mind. 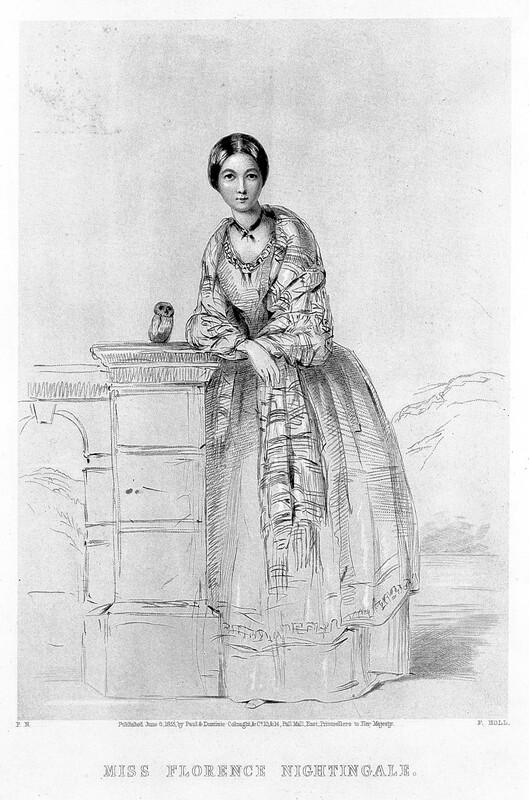 American poet and author of The Battle Hymn of the Republic Julia Ward Howe recalled that while she and her husband Dr. Samuel Gridley Howe were visiting the Nightingales at Embley that year, Florence asked Dr. Howe, “If I should determine to study nursing, and to devote my life to that profession, do you think it would be a dreadful thing?” He replied that it would be a good thing, a response that buoyed her hopes. She began to plan in secret to pursue her vocation. 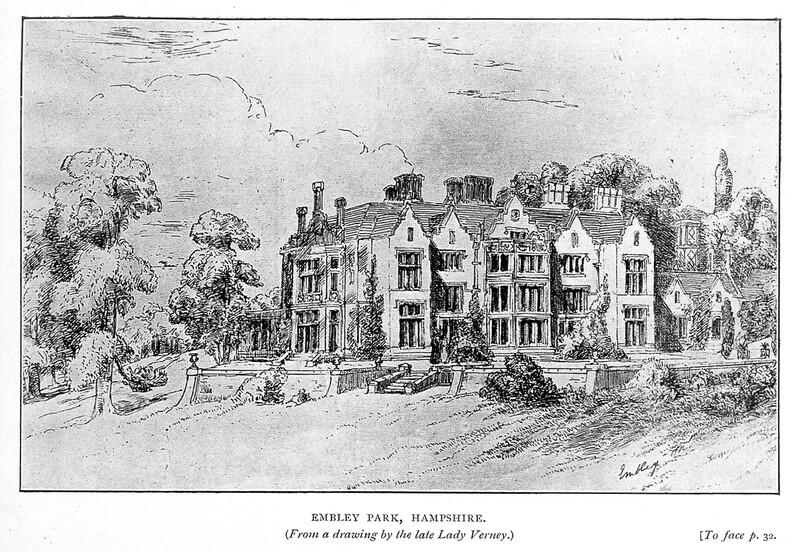 The plan was to learn the job by working as a nurse at Salisbury Hospital for a few months and then come home and display her newly acquired skills to such great advantage caring for the sick and destitute in the local village of West Wellow that any doubts her family might harbor would be instantly dispelled. She didn’t even make it to the first step. Her mother was so horrified by the idea of Florence working as a nurse in a hospital that the plan was stillborn. It wasn’t the gross aspects of the job that so terrified Mrs. Nightingale. Disease, exposed body parts, gruesome operations, rivers of blood paled in comparison to the sexual shenanigans doctors and nurses were reputed to indulge in on hospital wards. Nurses were widely seen as little more than doctors’ paid mistresses. Florence was passionately opposed to the life expected of her. She felt her calling to the marrow of her being. She wanted to be a “savior” in God’s name, for her existence to have a profound purpose. The Nightingales hoped some travel might distract their determined daughter, maybe even inspire her to follow her many intellectual pursuits instead of nursing. In 1847, Florence was sent to Rome with some friends of the family. She loved it, but as soon as she returned to London in 1849, she found work inspecting hospitals and working at schools for poor children. As for the Egyptian rubbish, you may do just what you like with it, keep it or give it away. There is nothing that reminds me of what I have seen, nothing that savours of my Karnak except the bronze dog, the brick seals which sealed the tombs at Thebes, and the four little seals in the light box … you don’t know how difficult it is to get anything at Cairo – for I know you will think, and very truly, what I have sent home very shabby. Parthenope kept them, and they remained in the family for almost a century. The last owner was Rosalind Nash, daughter of Florence’s cousin and her close friend and confidante. In 1949, she donated the group to what is now the National Museums Liverpool. On April 28th, they will go on display for the first time in Liverpool World Museum’s new Egyptian gallery, home to the second largest collection of Egyptian antiquities in the UK (the British Museum has the largest). Ashley Cooke, the senior curator of antiquities at the World Museum, is delighted to display her amulets at last. 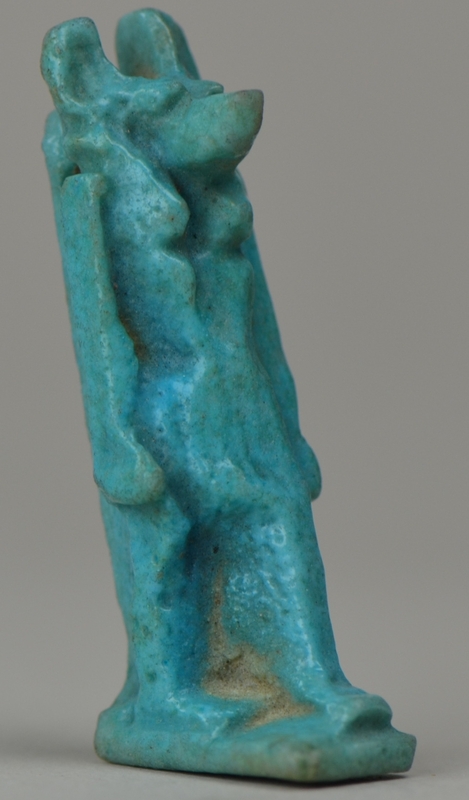 They included four to the protective goddess Taweret, particularly cherished by women during childbirth. Not even all the wonders, fake or real, of Egypt could keep Florence from achieving her goal. 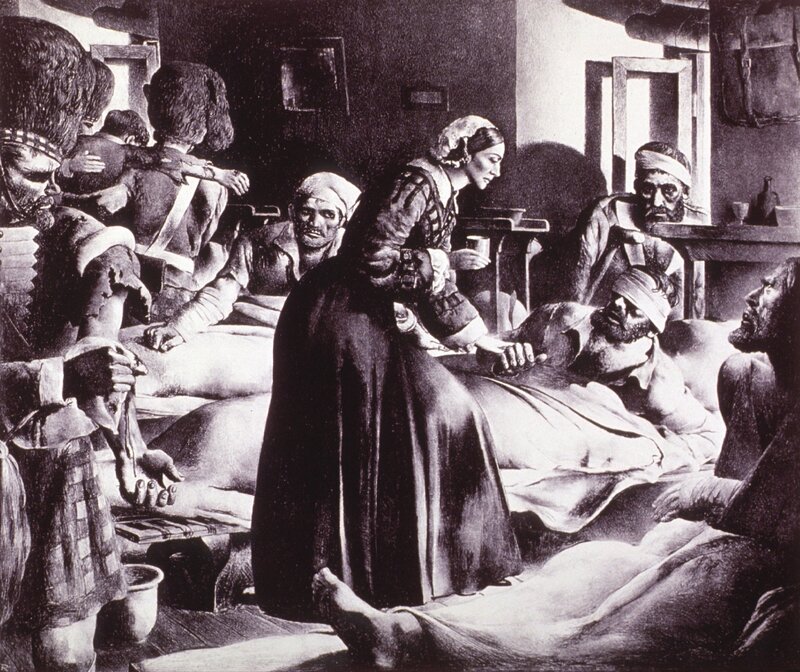 Five years after her trip to Egypt, Florence Nightingale went to tend to the wounded of the Crimean War, and the rest, as they say, is history. 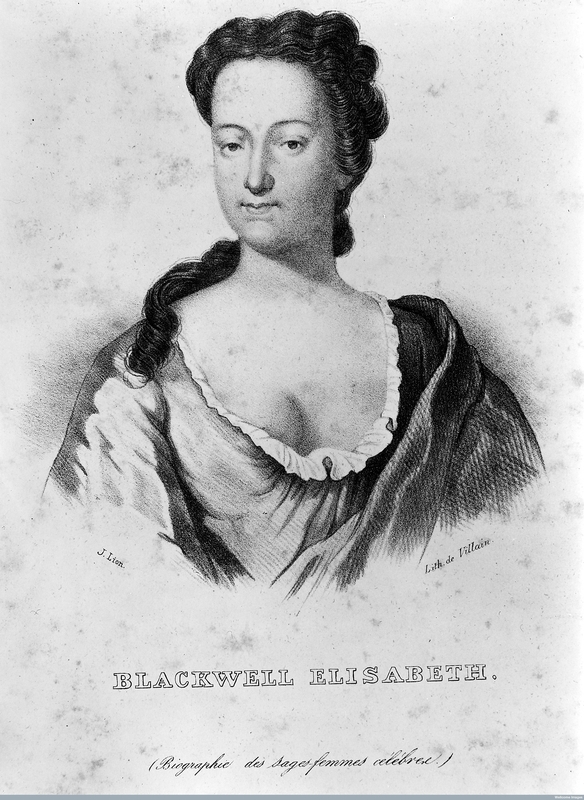 Her role in the war may have been overstated in hindsight, but her struggle against societal disapproval to even get a chance at nursing played an essential role in her many great accomplishments after her experience in the Crimea. She built nursing into a profession with standards of care and commitment, founded the first secular nursing school and advocated tirelessly for improving healthcare for people of all social strata. Since late last year, Jamestown Rediscovery archaeologists have been excavating the Memorial Church, built in 1907 over the foundations of three 17th century churches, the earliest being the 1617 timber-frame church in which the Jamestown colonists held the first representative assembly in English North America in 1619. (The second was built in 1640, the last in 1680.) The site was excavated in 1901 by the Association for the Preservation of Virginia Antiquities (today known as Preservation Virginia) before construction of the Memorial Church. The foundations of the 1617 church were discovered in that dig, but archaeological priorities and methods were different then, and the APVA team poured concrete between the remains of foundation and wall thinking it would keep them intact. Archaeologists today are removing the concrete (no small task — some sections are as much as five feet deep) to uncover elements in the soil that their predecessors wouldn’t have noticed or cared about but that contain potentially significant information about the construction of the 1617 church. 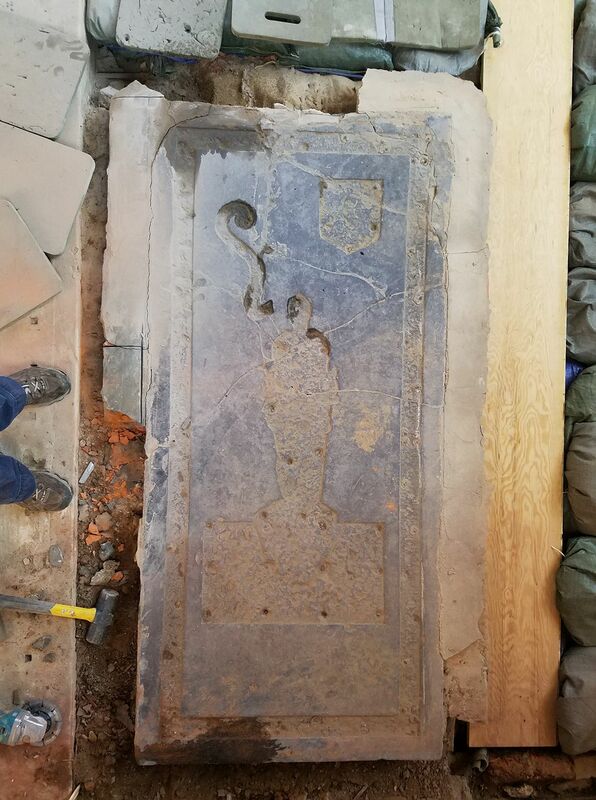 One of the aims of the new excavation is to conserve a unique ledger gravestone (a marker that lies horizontally covering the full length of a grave) known as the Knight’s Tomb. Moniker notwithstanding, there is no knight, or anyone else for that matter, buried under the stone. There was originally, but sometime in the 17th century it was moved to the chancel aisle, just inside the doorway of the brick church, and recycled as a paver. It is the only surviving ledger stone in the United States. The slab is six by three feet in dimension and has inset carvings which once held brass plates that identified and glorified the deceased. You can see the bolt holes that once affixed the plates to the stone. In the upper right hand corner is a shield, whose brass inlay would have been a family crest. Across from it is a scroll, and in the middle is a knight in plate armor standing on a rectangular pedestal which likely contained the full funerary inscription. Because of the loss of the brass plates, researchers aren’t certain who the knight in question was, but there aren’t a ton of candidates. There are in fact only two knights who were buried in the 1617 church: Thomas West, Lord De La Warre, who died on the transatlantic voyage and was buried in Jamestown in 1618, and Sir George Yeardley, who actually managed to land in the Americas alive and well. He was Governor of Virginia during that first General Assembly meeting held in the original church in 1619. He died in 1627 and was buried in the church. Bassett said after searching through the journals of both men’s extended families, he thinks Preservation Virginia may have found mentions of the stone by Yeardley’s step-grandson Adam Thorowgood II, whose mother married Yeardley’s youngest son, Francis. It was unearthed by the APVA in the 1901 dig. Its brass plates were long gone by then, and the stone was broken in several fragments, all of them quite large, one of them the full bottom half of the stone. They decided to keep it pretty much where they found it, moving it just a foot south. To seal it in place and fill the joins between the fragments, the team poured Portland cement around it and into the cracks. People loved their Portland cement back then because it’s so hard and durable, but as a preservation material it’s unfortunately terrible. The contrast between its hardness and the more porous, softer period materials causes moisture problems and puts undue stress on the historic structures. The Knight’s Tomb is no exception. 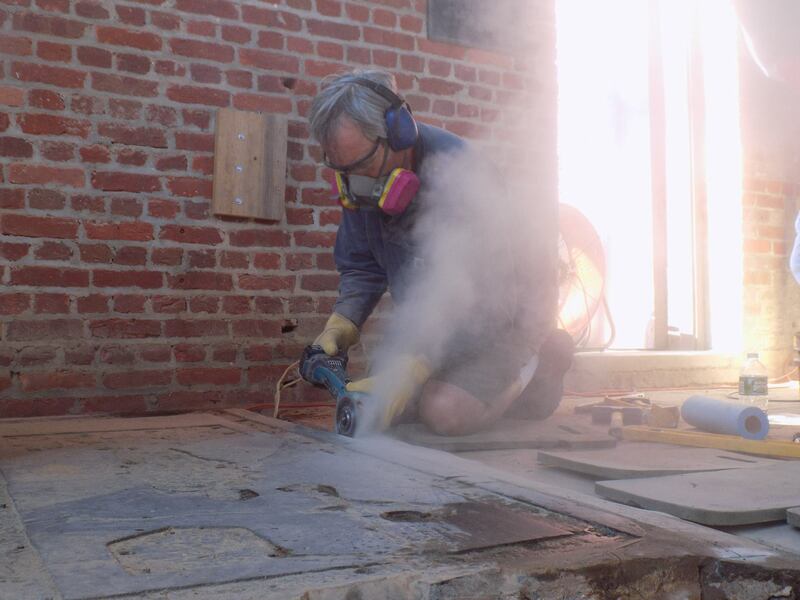 To ensure its long-term health, Jamestown Rediscovery archaeologists knew they’d have to get it out of that cement trap and into the hands of modern conservators who use materials that can be reversed should they cause problems down the line. 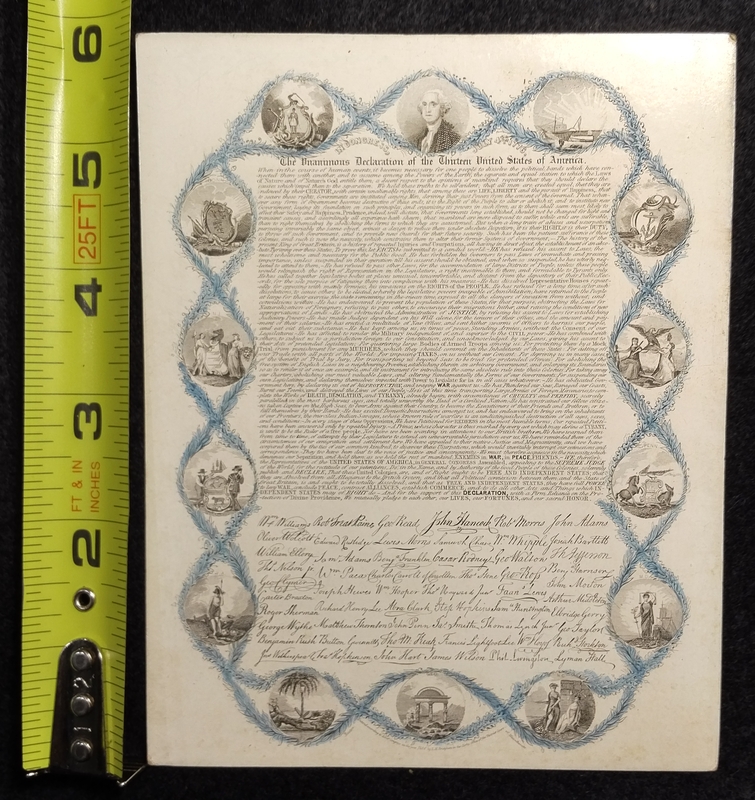 On April 10th, conservator Jonathan Appell of of Atlas Preservation, an expert in the conservation of historic monumental stone memorials and gravestones, began the difficult job of releasing the ledger stone. The cement around the edges of the gravestone was hand-chiseled away. Thankfully, the people who installed it in the floor of the Memorial Church in the early 20th century did not set it in a bed of Portland cement. Instead it was placed on slate shims over a mortared brick base, so once the cement was removed from the sides and under the edges, the stone could be pried off its base relatively easily. Once the Portland cement was gone, the stone came up in the same fragments it was first found in back in 1901. Very carefully and painstakingly, the team moved the stones up wooden ramps onto a platform where the detailed conservation will take place. That YouTube channel is a gem, very much worth following and/or bookmarking. They have several videos documenting the current excavation of the 1907 Memorial Church. Unrelated to the church and its tombs, this video about the discovery and conservation of the most complete set of jacks of plate (an armoured vest of overlapping plate sewn onto canvas) in the United States is just plain cool. Harvard researchers have discovered a second manuscript written on parchment of the Declaration of Independence in a county archive in Chichester, UK. 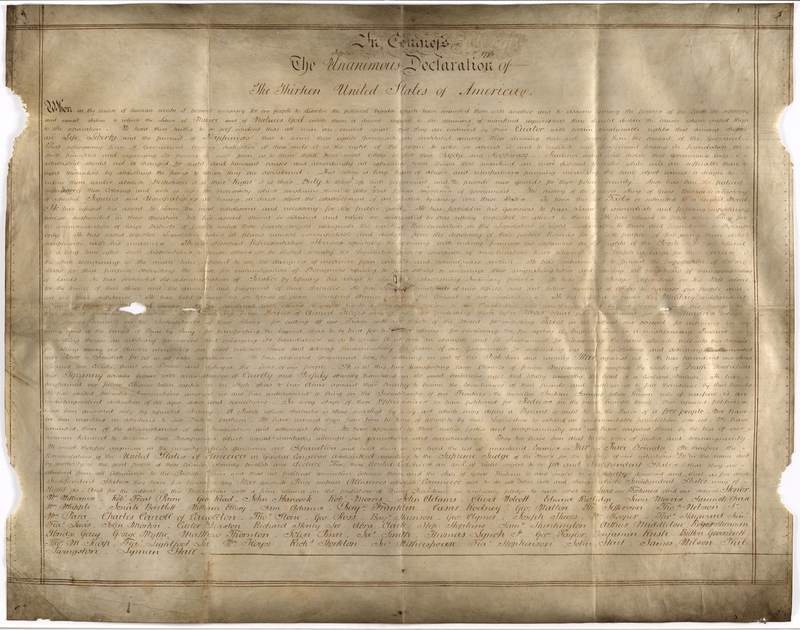 The only other parchment manuscript is the original Matlack Declaration in the National Archives, the large-scale, or “engrossed,” in the parlance of 1776, version with John Hancock’s John Hancock that everyone pictures when they think of the Declaration of Independence. The newly discovered one is engrossed too, at 24″ x 30″ the same dimensions as the Matlack Declaration, only this one is oriented horizontally instead of vertically. She initially suspected it would turn out to be a printed copy of a kind that were widespread in the 19th century because she had encountered such errors — copies mistakenly catalogued as manuscripts even though they were later prints — in other archives. The reference to parchment, however, was unusual and intriguing. She contacted the West Sussex Record Office and they sent her a CD with photographs of the document. The pictures made it clear that it was indeed a manuscript, not a printed copy, and that wasn’t the only uncommon feature. The names of the signatories were not in their traditional order, with Hancock’s signature first and the rest grouped according to the states they represented in the Second Continental Congress. The punctuation of the text is idiosyncratic and there’s very little of it. There appears to be a spot of erased text at the top, and the neat, compact handwriting was unlike any Sneff had seen before. Sneff took the pictures to her colleague Danielle Allen, and together they worked for two years to unlock its mysteries. They dubbed the manuscript the Sussex Declaration, which is more than a geographical designation. 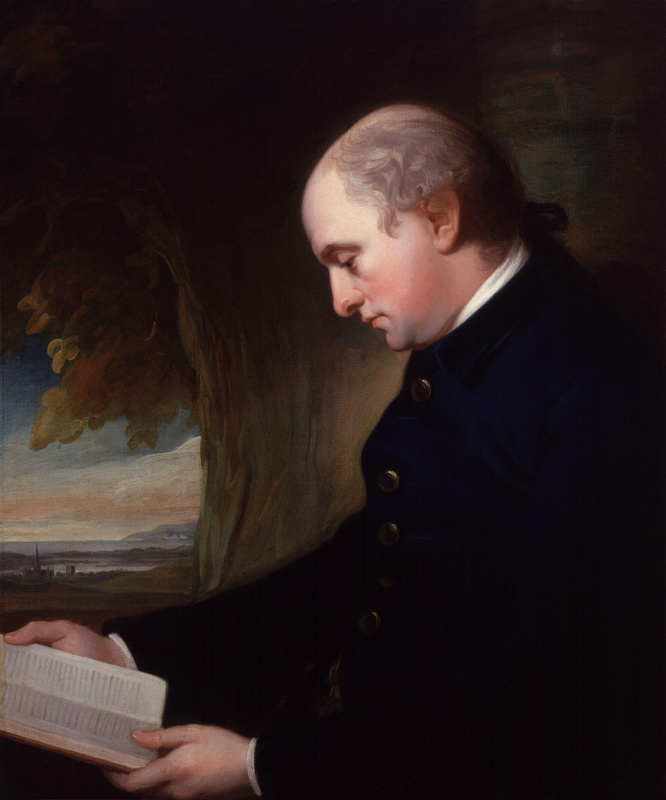 They believe the Sussex Declaration to have belonged to Charles Lennox, 3rd Duke of Richmond, also known as the “Radical Duke” for his avowed anti-colonialist stance and support of American independence. It was likely made in America, probably New York or Philadelphia, and then sent overseas to the Duke, but who commissioned it and whose is the wonderful hand that wrote it remain uncertain. 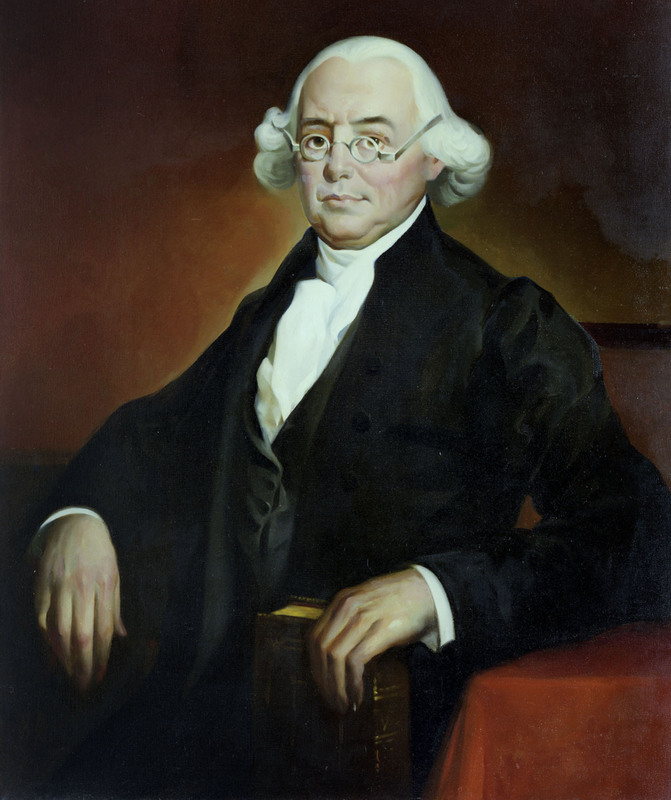 The leading candidate for the commissioner of the parchment is James Wilson of Pennsylvania, himself a signatory of the Declaration of Independence, one of the greatest legal minds of the nascent republic who played a large part in the drafting of the US Constitution and was appointed by President George Washington as one of the first six justices of the Supreme Court. He believed fervently that the principles of the Declaration should play a central role in the political ideology of the United States, despite its not having the strength of law. The Sussex Declaration, notably the arrangement of names, may be making a political statement about the importance of the new country having a strong federal government if it is to succeed. 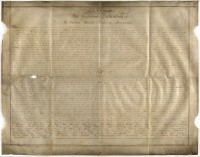 Analysis of the parchment, handwriting and spelling date the Sussex Declaration to the 1780s, a period when these issues were front and center in a United States in dire financial straits, fraught with conflict about the role of central government versus the states and still governed by the loose Articles of Confederation. Among the chief political debates of the era, Allen said, was whether the new nation had been founded on the basis of the people’s authority or the authority of the states. By reordering the names of the signers, perhaps the most conspicuous feature of the parchment, the Sussex Declaration comes down squarely on one side of the argument. On most documents of the era, Allen said, the protocol was for members of each state delegation to sign together, with signatures typically running either down the page or from left to right, with the names of the states labeling each group. An exception was made for a small number of particularly important documents — including the Declaration, which was signed from right to left, and which omitted the names of the states, though the names were still grouped by state. Read about Sneff’s and Allen’s use of handwriting and parchment analysis and their examination of spelling errors in the names of the signatories in their first published paper on the Sussex Declaration (pdf). Their second paper (pdf) focuses on James Wilson, the evidence indicating he commissioned the Sussex Declaration and why. They’re both fascinating, but I was particularly captivated by the second because I knew nothing about James Wilson and he deserved far better from me. 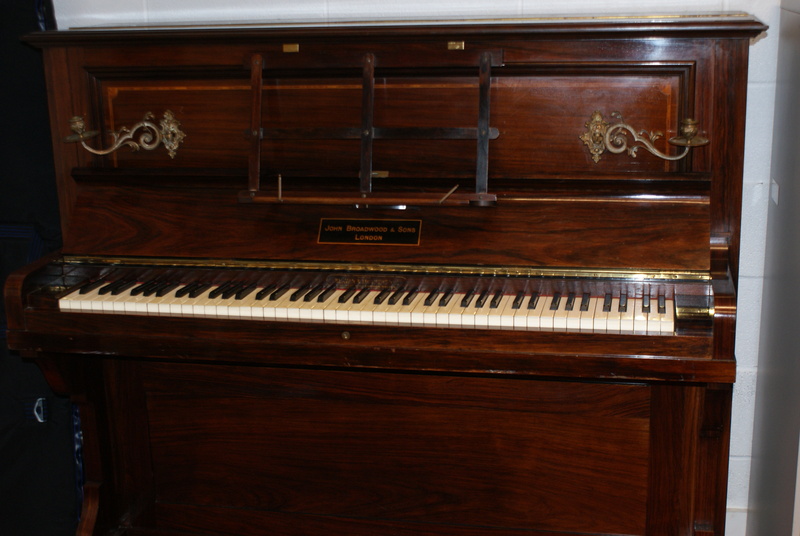 Last November, piano tuner Martin Backhouse was having a hard time with some sticky keys on a 1906 Broadwood & Sons upright piano he was overhauling for The Community College of Bishops Castle. Martin found the problem when he removed the keys: eight parcels full of gold coins. The school alerted the Finds Liaison Officer for the region, Peter Reavill, and he and his colleagues at the Portable Antiquities Scheme examined and catalogued the hoard. Inside seven cloth-wrapped parcels and one suede drawstring pouch, they counted 913 gold sovereigns and half-sovereigns ranging in date from 1847 to 1915, issued in the reigns of Queen Victoria, Edward VII and George V. The weight of the coins totals more than 6 kilos (13+ pounds) of gold bullion. One of the pouches was packed with cardboard that provided an important clue to when the hoard was hidden. It was an ad for Shredded Wheat created after 1926 and likely before 1946. Attempts to trace the ownership history of the piano to determine who might have stashed the coins inside it went nowhere. After its manufacture by Broadwood & Sons of London, it was sold to music teachers Messrs. Beavan & Mothersole of Saffron Walden, Essex. There is no trace of its movements for almost 80 years. The trail picks up again in 1983 when it was acquired by Mr. and Mrs. Hemming, also of Saffron Walden, for the children to learn on. It remained with the Hemmings until last year when they donated it to the Bishops Castle Community College. 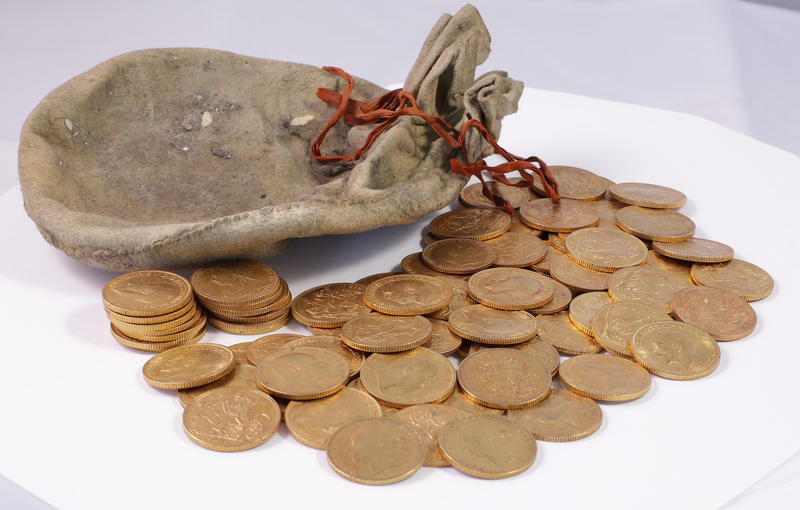 On April 20th, John Ellery, senior coroner for Shropshire, held an inquest in Shrewsbury and declared the gold coins treasure according to the 1996 Treasure Act, which means they now officially belong to the Crown. The British Museum will convene a Treasure Valuation Committee to assess the market value of the coins. Local museums will be given the chance to acquire the hoard for the assessed sum, which will then be split between finder Martin Backhouse and the piano’s owners, the Bishops Castle Community College. Coins made of precious metals that are more than 300 years old qualify as treasure, but these coins are comparatively recent. The determination that they are treasure is based on three criteria: 1) they are made of gold, 2) they were deliberately hidden with the ultimate aim of recovering them at a later date, 3) the owner and/or heirs are unknown. This was the standard applied to the Hackney Double Eagle hoard discovered in a London backyard in 2010, whose coins are also gold and have almost the exact same date range (1854-1913). The publicity from that case resulted in the identification of the legitimate owner, the son of the original owner who had died in 1981. That has not happened in this case, despite the coroner adjourning the inquest twice to give any potential claimants the chance to come forward. Surprising absolutely nobody, many claimants came forward, almost 50 of them, hoping to get their hands on some of that sweet, sweet gold sovereignage, but no evidence was found to substantiate any of the claims, hence the treasure verdict. This video from the British Museum’s YouTube channel tells the story of the Piano Hoard.